The town was governed by a bailo who was appointed by Venice and was assisted in his duties by two councilors; nevertheless the local community also had a role in the administration of the island (Papadia-Lala 2006, 34-5). In the time of the Council of Ferrara these were the names of the bailo of Euboea: M. Grimani (1436-1438) and Fantino Pisani (1438-40) (Bury 1886, 352). From 1314 onwards the Latin Patriarch of Constantinople also resided at Negroponte and bore also the title of the Bishop of Chalkida. However often the Latin patriarch would not actually live on the island, but was always represented by another member of the church, who would take over all the responsibilities and duties of the Patriarch (Mastrodimitris 2006, 121-2). Although there was a Latin Patriarch there was not a Greek bishop in Euripos, only a protopapas as in other Venetian colonies, but nevertheless the Orthodox Church and its representatives enjoyed special privileges (Maltezou 1993, 289; Maltezou 2006, 21). 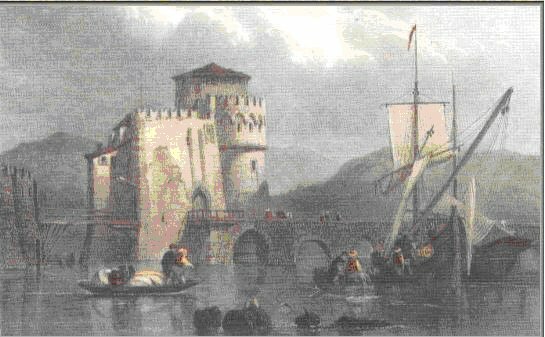 The town of Negroponte had two fortified harbours on each side of the Euripos Bridge, where also the sea gate, the Porta di Marina stood. 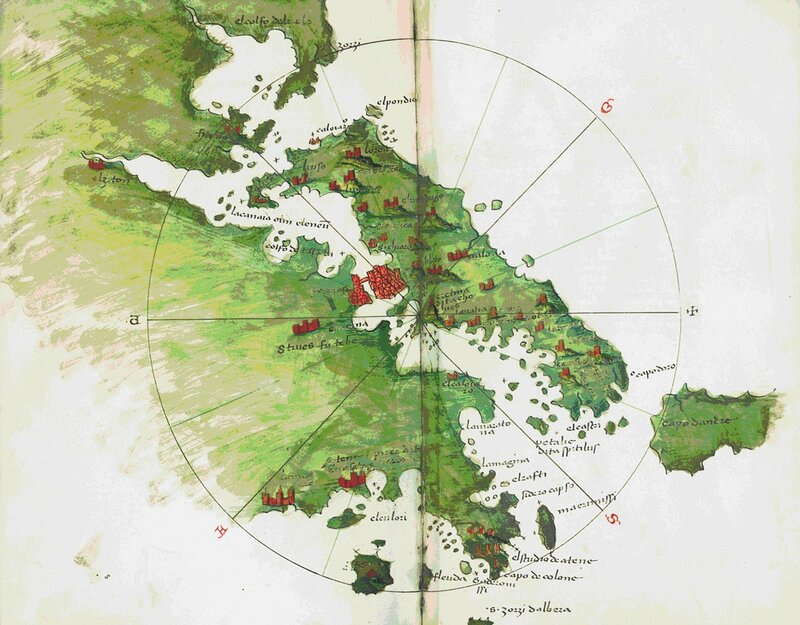 In the beginning of the 15th c. the Venetians built a tower in the south port in order to control the passage of the ships (Triantafyllopoulos 1970, 198-99; Koder 1973, 156-8; Georgopoulou 2001, 73). The town also featured a palace for the governor (bailo) and the loggia, located across from the palace, the church of St Mark as well as other churches and houses (Georgopoulou 2001, 82; Andrews 2006, 185). Much debate has been taking place regarding the cathedral of Euripos, St. Mark since some identify it with the church of Ag. Paraskeui suggesting that it was originally a Byzantine church dedicated to the Virgin, which was altered by the Venetians (Georgopoulou 2001, 112). Others date some of the architectural members of the church to the 13th c. and suggest that the church of Ag. Paraskeui was actually a church built by Dominican monks who came and settled in Negroponte in the late 13th c. (Delinikolas- Vemi 2006, 250-2; Triantafyllopoulos 1970, 202). The palace of the bailo stood opposite from Ag. Paraskeui and it was a Frankish two-storey building, flanking the entire side of the main square. Later an Ottoman structure was added to the side of the Frankish building making it larger (Delinikolas-Vemi 2006, 254). The loggia was surrounding the main square from three sides and had also an upper floor with some kind of balcony. Today remains of the loggia can be seen, especially the ground floor with openings and arches of the gothic style (Delinikolas-Vemi 2006, 255). The location of the Patriarch’s residence has not been identified, although it has been suggested by scholars that it was situated around the open square where the mosques stands now (Triantafyllopoulos 1970, 200-1). Finally Negroponte was also a place of some religious importance since it had many churches in the heart of the town and the suburbs, such as those of St Nicolas and St Margaret, as well as monastic complexes (in the 14th c, there was already a Franciscan monastery) (Georgopoulou 2001,159). Today not much survives from the Venetian Negroponte. The walls, towers and moat are mentioned in the records of the Venetian Senate until 1470 (Georgopoulou 2001, 59). The tower on the bridge was destroyed when new bridge was built in the 19th c., only the base of the tower in the south port is visible and although the walls still stood in Victorian times, they gradually fell into ruins (Morris 1980, 63).